Carlos A. Rosillo, is founder of the internationally acclaimed French watch company, Bell & Ross. The company has made a huge impact on the competitive, luxury watch industry since it first began over 20 years ago. Bell & Ross is a French watch company founded in 1992. Words that define the Bell & Ross brand are: efficiency, legibility, and reliability. They had a goal of establishing a strong luxury watch brand and offer a luxury timepiece with an efficient chronometer, to meet the desired needs of the industry’s most demanding aviation user. We wanted to get a first hand perspective from Mr. Rosillo’s thoughts about the luxury watch industry plus insight into the Bell & Ross approach to watch design, engineering and marketing. Could you give our readers a brief summary of how you view the Bell and Ross brand today? We created extremely precised collections that immediately categorized us as a “niche brand”! But I do not dislike this image, in a way, it describes us as a brand that “knows what it wants”, which has a clear objective, who presents a solid collection, and that is for customers that have personality. The watch company was founded back in 1992. As you look back on your first twenty years with Bell and Ross, what have been the most significant developments? The difficulty was the upkeep of this specificity, in its development in time, facing competitors that weren’t staying still. We had to conciliate a permanent renewing and the creation of a real collection that remains faithful to our direction. How did you get involved with watches? Where did the interest come from? What does Bell and Ross want to achieve in the next twenty years? We are positioning on the professional and technical watches segment where our iconic and timeless Instrument model is ranked as the key model. Our goal for the next years will consist in staying the course and maintaining the brand’s fundamentals while innovating constantly. Our iconic timepiece: the BR01 Carbon or the simple idea to turn a cockpit instrument panel clock into a wrist watch. It takes its inspiration from the aeronautic instrumentation, an absolute reference as far as readibility, reliability and performance are concerned. What Percentage Of Thought Goes Into Movement Conceptualization Versus Pure Aesthetics? For the basic models we aim to maintain a good balance between quality and price. As for the high end pieces, for which we do not have no price or material constraints, we can really create our own work of art, by developing our own specific movements thanks to collaborations with the best watchmakers. Our last collections are the proof of this trend as we use mechanisms either developed in cooperation with the best watchmakers like we did for our Tourbillon models or the Jumping Hour, either working with prestigious suppliers like Dubois Depraz or La Joux-Perret. However, we develop our creations based on a key principle: “Every detail has its own meaning and function.” To design and manufacture watches, the designer adheres to precise specifications, focusing above all on the needs and requirements of professional users. Functionality is key, and minimalism is vital. Our motto is that the essential is never compromised by the superfluous. All our watches are therefore designed according to four fundamental principles necessary for the completion of missions under extreme conditions: legibility, functionality, precision and water-resistance. Steve Jobs Once Said “I’ve Never Used A Focus Group, I’ve Never Used a Consultant to Design a Product,” Are Things Done The Same Way At Bell and Ross? Who Is In Mind When A New Piece Is Conceived? Everytime we design a watch we try to think of the professional that will be using the instrument and start from there. We do not proceed with a market analysis. Bruno Belamich’s role is to think of the collections every year. He dedicates part of his day thinking about what we want to do next in terms of design. As the Creative director of Bell & Ross, he is totally involved on all aspects of the Creative process of each timepiece. But we work as a team and this is what I call the combination of expertise. We use the combined skills and know-how of master watchmakers, engineers, professional users and designers in order to refine each watch design into something exceptional. The Aviation collection is our favorite; do you have any plans to make any changes to the current BR models? The BR Instrument collection had all the required qualities to become a classic: it has become an icon, it is unique, and its design is timeless. As far as the future is concerned, instrumentation is at the heart of our inspiration, but we are concentrating on the tools that are vital to piloting. Several “High-End” Watch Manufactures Have Built Less Expensive Lines To Bring Younger Buyers Into The Brand. Does Bell and Ross Have Any Plans To Do That? Our starting point to create a new model or a collection is always the same: does it make sense for a professional that would be using his Bell & Ross watch as an instrument? Are you aware of any famous people who wear your luxury Bell & Ross watches? We do have famous actors or sportsmen wearing our watches. But what matters most is to know that professionals or military people are using them. They are the reason why we create those utilitarian timepieces; they are therefore our best ambassadors. There has been a lot of attention given to investing in watches as a more secure market than traditional methods. Do you think Bell & Ross offers a collector or investor the chance to have strong returns in the future? 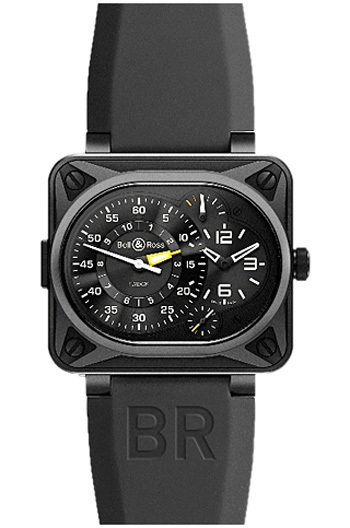 I think that with the launching in 2005 of the BR 01 square case watch that became our iconic timepiece lots of our customers became collectors. Our impactful limited editions like the BR01 Airborne, the BR01 Instruments but also our Vintage WW1 Jumping Hours have also contributed to increase the number of collectors, all these models being sold out in no time. But the watch that embodies all the Bell & Ross know how in watchmaking is the BR Minuteur Tourbillon. This exclusive timepiece is the proof of our watchmakers’ excellence as it incorporates four watchmaking complications: a tourbillon, a Flyback timer, a power reserve indicator and an independent small second. At Bell & Ross we always search to produce high quality, perfect reliable and very impactful timepieces in keeping with our four creation principles: legibility, precision, functionality and water resistance, that became our DNA. It is very important as well to accompany our customers with high quality services in harmony with the brand’s universe. The watch making industry is always changing to adapt to the evolution of the demand and market rules… and the current period is particularly active! One of the things that strikes me is the strong change in the clientele segmentation with the fast development of new markets such as China. There are so many great brands out there today, assuming you weren’t the President of Bell and Ross, what would be on your wrist? A FP Journe timepiece like the Chronometer Blue. Who Else within the Industry Do you Really Respect and admire? I do have a certain interest for few brands like François-Paul Journe or Jacquet Droz. Since This Is Your First Profile With Us, Can You Tell Us More About Your Life Outside of Watches? I am passionate with Asia where you can find serenity, a service and a cultural tradition that doesn’t exist anywhere else. I am also an architecture, and art aficionado. And I love to cook. To purchase a luxury watch from Bell & Ross, please contact The Life of Luxury. Follow our luxury blog for the latest luxury watch news and fine watch product releases.